The Joe Cool Band are delighted to return to the Paynesville Music Festival this year aboard the Lady Jodie for 3 one hour cruises on Saturday and Sunday. Joe Cool is a semi accoustic trio and features Jim Allen on guitar, uke, harp and vocals. Jim has a wealth of music experience, is a primary school music teacher and has played in Cafe Ole, China Shop Bulls and with Kim White . Chris Taylor also plays guitar and sings and has played in several bands since the 1980s including Breakfast In Bed, The Fabulous Tussock Brothers and The Penetratorz. Loren Brooks is the lead vocalist but is unfortunately unable to join this year. Filling in will be Brad "Dong" Bennet who hails from the long serving rock band "Underdog" and current group "The Jimmys". Brad is sure to rock up the cruises with his gutsy vocals. 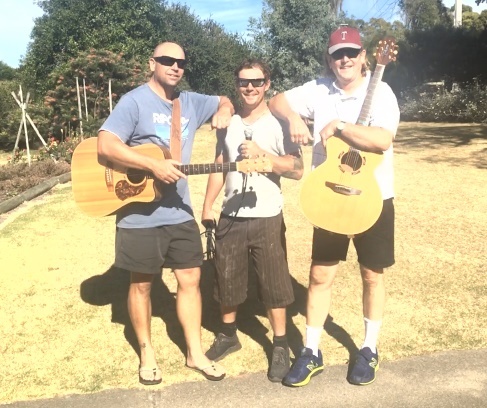 Joe Cool will play a variety of music ranging from blues, country, popular and light rock and the idea is for everyone to have an enjoyable experience. Audience participation is a must! Each cruise lasts for about one hour and patrons are encouraged to book in advance as most cruises sell out.